Today on CNN’s State of the Union with Candy Crowley, Israeli Prime Minister Benjamin Netanyahu spoke to Wolf Blitzer about the ongoing conflict between Israel and Hamas, and the extended nuclear talks with Iran. BLITZER: We’re being seen now by viewers in the United States and around the world in more than 200 countries around the world right now. I mean, we didn’t seek this escalation. Hamas forced it on us. They started rocketing our cities, steadily increasing the fire. I called for de-escalation. They refused. I accepted an Egyptian cease-fire proposal backed up by the Arab League and the U.N. They refused. Just imagine — I mean, imagine what Israel is going through. Imagine that 75 percent of the U.S. population is under rocket fire and they have to be in bomb shelters within 60 to 90 seconds. So, I’m not just talking about New York — New York, Washington, Chicago, Detroit, San Francisco, Miami, you name it. That’s impossible. You can’t live like that. So I think we have to bring back, restore back a reasonable, sustained quiet and security. And we will take whatever action is necessary to achieve that. They’re not only targeting our cities. They’re deliberately firing thousands of rockets. They have already fired 2,000 rockets in the last few days on our cities. You can imagine this. It’s not only that. And they wanted to kill as many of our six million Israelis who are targeted as they could. They haven’t succeeded not for lack of trying. It’s because we have developed, with American help — and I appreciate the help that President Obama and the U.S. Congress have given us to develop these Iron Dome, fantastic systems. Terrorists pop up there, try to murder civilians, kidnap Israelis, as they did with Gilad Shalit. So we’re taking action right now to neutralize those tunnels. And we will continue the action as long as is necessary. BLITZER: You see these painful pictures, though, of these Palestinian children and these refugees, thousands of them fleeing their homes. It’s a horrendous sight, what is going on right now, if you look at the images, heart-wrenching. NETANYAHU: I’m very sad. When I see that, I’m very sad. We’re sad for every civilian casualty. They’re not intended. This is the difference between us. The Hamas deliberately targets civilians and deliberately hides behind civilians. They embed their rocketeers, their rocket caches, their — their other weaponry from where — which they fire — which they use to fire on us in civilian areas. What choice do we have? We have to protect ourselves. So we try to target the rocketeers. We do. And all civilian casualties are unintended by us, but intended by Hamas. They want to pile up as many civilian dead as they can, because somebody said they use — it’s gruesome. They use telegenically dead Palestinians for their cause. They want the more dead the better. BLITZER: The argument that your critics make is that you’re overreacting right now, overkill. I mean, there are very few examples in history of countries that have been rocketed on this scale. If you look at our response, it’s actually very measured and trying to be as pinpointed as we can. But I think, when people say that — I appreciate the support we have received from President Obama and many world leaders for Israel’s right to self-defense. But others are saying, yes, you have the right of self-defense, as long as you don’t exercise it. What can a country do? What would you do? What would the people of the United States do if — if your cities were rocketed now, 2,000 rockets falling in American cities? People would say in the United States, as they’re telling me, obliterate the people. We don’t obliterate them. We don’t want to — we don’t have any battle with the Palestinians in Gaza. We try to target the military targets. And, unfortunately, there are civilian casualties, which we regret and we don’t seek. They all fall on the responsibility of Hamas. BLITZER: The president, President Obama, he urged you the other day to — all the parties to return to the cease-fire that was reached in November 2012. Are you accepting his proposal, go back to that cease-fire? BLITZER: If they accepted now — is it too late? NETANYAHU: We’re doing that right now, as we speak. 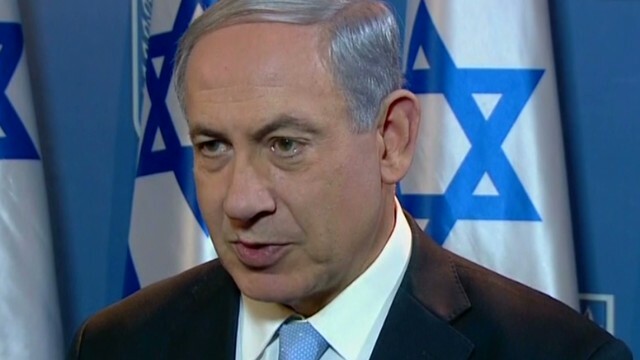 NETANYAHU: It’s being done fairly quickly. NETANYAHU: Well, you know, here’s the difference. We don’t glorify these killers. We put — we apprehended him in three — three days after the — that tragic killing, immediately put them in custody. We’re putting them on trial. They will serve a good chunk of their lives in jail. That’s what we do with the killers. We don’t name public squares after them. We don’t glorify them. We don’t educate our people, our children in suicide kindergarten camps, as happens in the Palestinian side. This is not our way. We have — I think a society is tested not by the extreme fringes of that society, but how it takes care of them. We take care of those extreme fringes. We basically isolate them and ostracize them and punish them. I think what you see in Palestinian society, but especially in Gaza, is that these people are lionized. And the worst thing that I see, the worst thing is that they use their children, they use their civilians. They don’t give any thought about them. I mean, the Hamas leaders are divided into two. Those who are under — in underground bunkers in Gaza, they don’t care. Let the people there, you know, with the rocketeers and with the attack tunnels, let them die as Israel tries to surgically take them out. But they’re safe underground, the military leaders. And then they have got the political leader, this guy Khaled Meshaal, who is roaming around five-star hotel suites in the Gulf states, having the time of his life, while his people, while he’s deliberately putting his people as fodder for this horrible terrorist war that they’re conducting against us. So this has to stop. And I think many people in Gaza understand that Hamas is destroying Gaza, destroying their lives. They have taken tons — not tons — tens of thousands of tons of concrete that we enable them to bring into Gaza to build skyscrapers, to build schools, to build hospitals. I think it — I think the international community has to — once this is put in place, we really have to undertake a program to demilitarize Gaza and to change the situation, because it’s unacceptable. What makes it unacceptable is Hamas and Islamic Jihad. BLITZER: We’re out of time, but one final question on Iran. NETANYAHU: Now, you know I never talk about — about what Israel will do or not do. But I think what is important is that there wasn’t a bad deal, because there’s no deal. And no deal is better than a bad deal. We will see what the extension produces. I think a good deal is what was achieved with Syria. They’re under the threat of U.S. military action. And with the joint effort by President Obama and President Putin, Syria removed its chemicals and the capability to make chemical weapons. They didn’t just keep it in place, freeze it, and put it under a lock and put an inspector on it. They actually dismantled and removed. That’s not what Iran is holding out for. Iran wants to keep its capabilities and say, we will put a lock under and you can inspect it. But the whole idea for them is that, at a certain point, they break the lock. The inspector will even say they broke the lock. It will take him a few weeks to put together the wherewithal for a nuclear bomb. That’s a bad deal. Don’t make that deal, because if you think the Middle East is bad now, with ISIS, with Hamas, with Hezbollah, and with Iran, wait until Iran, one of the pre — the preeminent terrorist state of our time, has nuclear weapons. Then I would say the world goes into a tailspin. Don’t let it happen.